THE REVOLUTION MAY BE OVER--but the future is just beginning! Ripped from the pages of the hottest crossover of the year, the REVOLUTION team of John Barber and Fico Ossio continue the action! KUP is a CYBERTRONIAN literally older than the universe; ACTION MAN is the ultimate special agent trying to live up to an impossible legacy; MAYDAY is a G.I. JOE leader trying to rescue her first command; and BLACKROCK is a CYBERTRONIAN that thinks he's a human. It takes the mind-bending clash of ROM versus MAJOR BLUDD and the OKTOBER GUARD to bring this unlikely team together... and the secret they learn threatens to unravel the entire universe. New tales that continue the storyline of the hit Revolution comic-book event and featuring the same amazing creative team! Exclusive bound-in, Sgt. Savage mini-comic reprinting a lost tale written and drawn by the late, great JOE KUBERT himself! 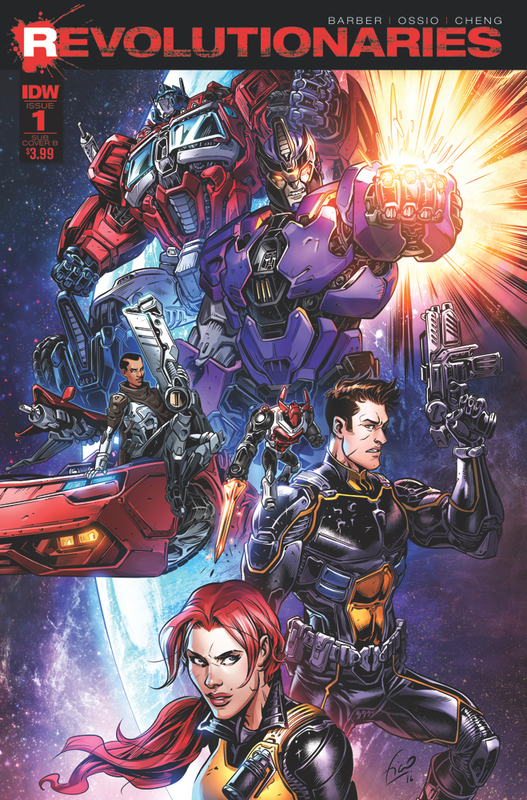 The secrets of the Hasbro universe will be revealed. If you follow one new book this month, make it Revolutionaries!